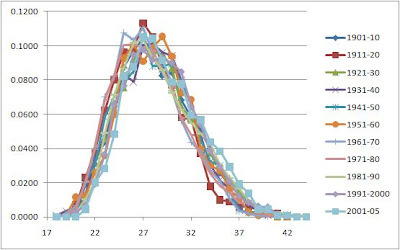 In 2006 I wrote an article for Beyond the Boxscore called Player Aging Patterns Over Time. One thing I showed there was what percentage of the full-time players in any decade were a given age (I used 400+ PAs for full-time). 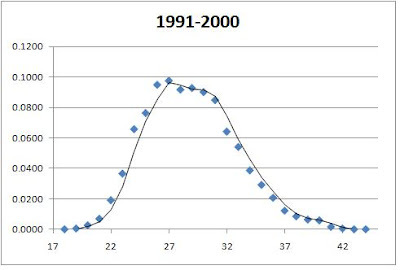 Below is a graph of the distribution for 1991-2000. The trend line is the two year moving average. Usually 27 is the highest, with around 10% of the full-time players being that age. 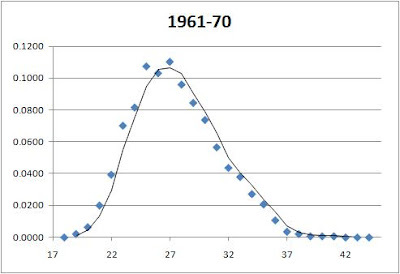 Now for the 1961-1970 period. No reason why I picked these decades. Just wanted to show a sample. The next graph as all the decades starting with 1901-10. The table below shows the average of each decade's percentage for each age (it was just a simple average, so for age 27, for example, I just added its percentage from each decade and divided by 11, the number of decades I used although 2001-05 was only a half decade).